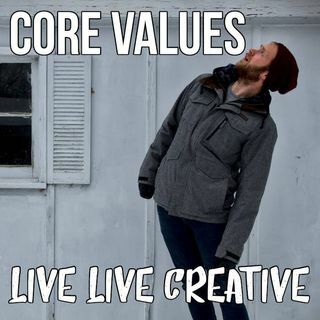 This is an episode that maybe I should have created closer to the beginning of the podcast, to really lay out the core values of what the show is about, so that anybody new to Live Life Creative would understand what it means and how it’s going to help them. But I think I needed a little bit of time to figure out exactly what it is for myself first. I dived into creating this podcast head first, and I didn’t have all the answers then. For that matter, I still haven’t figured out all ... See More the answers, I just have a little clearer idea of what some of them are now. I know my ideas aren’t going to get better without help from you and other people listening. So, if you hear something you think is nuts or way off base, the show needs your feedback to refine these core values. Send me a DM on Instagram, @livelifecreativepodcast, or the contact form on the website, livelifecreativepodcast.xyz. You can help the podcast by leaving a rating and review on the podcast app you're using right now, it's much appreciated! And it really does make a difference. Each time you make any purchase through the link, a small percentage of your purchase comes back to the show, at no cost to you.